Does anyone else ever feel like they’re pulling teeth just to get their kids to tell them about their day? Our son is only 6, but he might be mistaken for a glum teenager at dinnertime if I try to ask him what he did at school. Rather than being sullen, he’s often just lost in his own thoughts and doesn’t hear me - but it still makes me reflect. Real communication is definitely a skill - and one to be treasured. That’s why I’m excited about our new family game that really puts your listening and communication skills to the test. Disclaimer: A copy of Gnomes at Night was provided to us by MindWare - the parent company of Peaceable Kingdom - with no expectation of a review or recommendation. 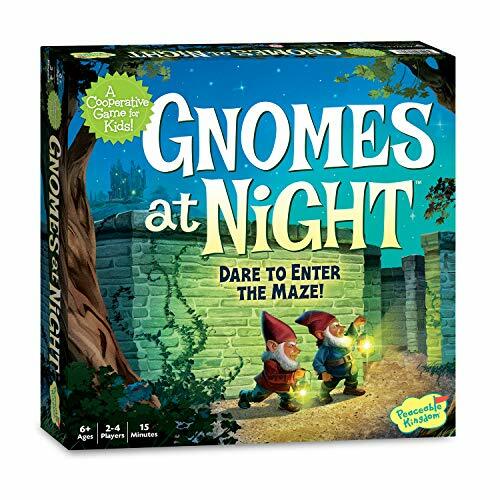 The newest addition to our collection is Gnomes at Night - a cooperative maze game by Carlo A. Rossi and Alfredo Berni. But this time when I say cooperative, I really mean it. Cooperation is not a choice in Gnomes at Night, and that’s what makes it special. One of the many reasons we love cooperative games is that they provide us with the opportunity to work together and give advice and teach our kids about strategy along the way. But, if you really think about it, this can often devolve into no cooperation at all if someone is being the captain of all of the decision making. This is definitely not an issue with Gnomes at Night, and I’ll explain why in a moment. But first let me describe what this game is about and how it plays. Queen Benevolence has had twelve special treasures stolen from her castle. The thief has escaped into the castle’s maze, and he’s dropping the treasures along the way. The queen has called on her friends the gnomes to find and return her extraordinary items - things like a dragon’s tooth, a glass key, and magic moss. I dig the fantasy theme, and the artwork is great for setting the mood. There are two sides to the maze, and there are six treasures scattered about on each side. Two magnetic gnomes connect together through the vertical board, and it’s your job to get your gnomes to each treasure before the time runs out. The problem is, the walls of the maze is different on both sides of the board, and you can only see one side. That’s why cooperation is not an option here, it’s absolutely a necessity. You can never move your own gnome through a wall, but it’s okay if your partner does it, as long as they aren’t moving through a wall on their side of the board. 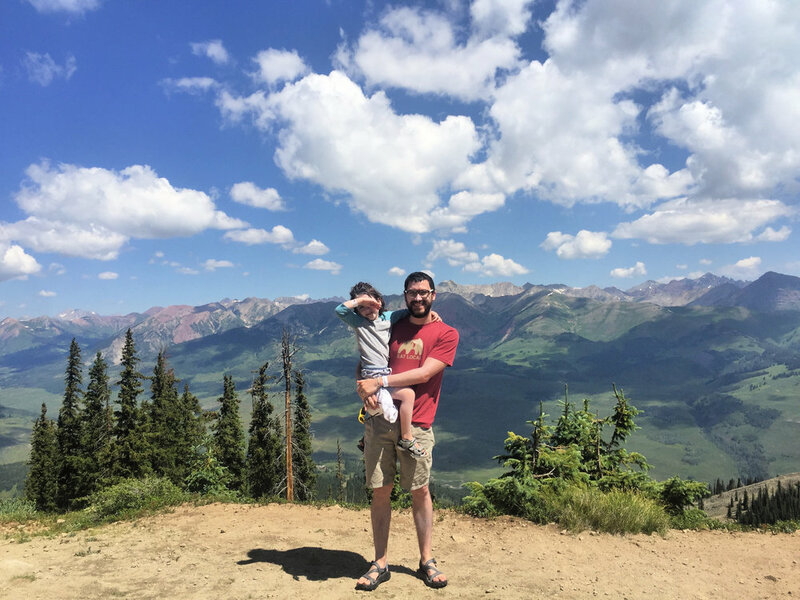 In order to succeed, you absolutely must tell your partner where to go for the next treasure, and what you need them to do to get around obstacles. This is really the king of cooperative kids games. It is an absolute blast to play this game with our 6-year-old. I love how much communication it forces. You need to tell each other where the treasures are and when you have walls you can’t cross. Even stating your intention to move the gnome is necessary - because if both players try to move their gnomes at the same time they will often disconnect and fall, forcing you to start back in a corner. And it’s very clearly a tremendous exercise of spatial reasoning. After a little practice, I found myself recalling where walls were on the other side of the board, and what path we might need to take to get to a certain area. But there are also multiple maze cards, so that discovery will always stay fresh. The first time we played we only found two treasures in the two and a half minutes - an abysmal score! But we worked on our communication skills and strategy and it wasn’t long before we found every treasure in the maze in the allotted time! The game works great with just 2 players, but there’s also a built-in way to play with partners on both sides. Each treasure is color coded in a way that lets all 4 players know who is in charge of talking and moving the gnome for each item. Or, if your kids are younger, you could just team up and work together on one side. Our son teamed up with Mom for the first round (the one where we only found two treasures) - but once he understood the game he was ready to captain his side of the board completely alone and dominate. It’s no secret to regular readers that we are huge fans of Peaceable Kingdom games because of their focus on young audiences and cooperation. There are so many different Peaceable Kingdom games that I would recommend as the first board game for a child. Race to the Treasure! will always be the first board game I remember playing with our son, and there are several more we’ll remember fondly forever. And now you can certainly add Gnomes at Night to that list. Have you tried Gnomes at Night yet? What’s your family’s favorite cooperative game? We’re always in the mood for a good recommendation. Tell us in the comments!